Hailed by the Gramophone Magazine as “brilliant and intrepid”, violinist Airi Yoshioka has concertized throughout the United States, Europe, Asia, and Canada as a recitalist, soloist and chamber musician. Deeply committed to chamber music, she is the founding member of the Damocles Trio and Modigliani Quartet and has performed and recorded with the members of the Emerson, Brentano and Arditti Quartets. Damocles Trio’s debut disc of complete Piano Trios and Piano Quartet of Joquín Turina has won a four-star rating from the BBC Music Magazine, Le Monde de la Musique and Diapason. Her orchestral credits include performances with the Orpheus Chamber Orchestra, American Sinfonietta and engagements as concertmaster and soloist with the Manhattan Virtuosi and concertmaster of one of the festival orchestras at the Aspen Music Festival. An enthusiastic performer of new music, she was one of the original members and concertmasters of the New Juilliard Ensemble and had performed annually in Juilliard’s FOCUS! Festival and is currently a member of Continuum, ModernWorks!, RUCKUS, Son Sonora, and Azure Ensemble. Of a performance with the New Juilliard Ensemble, the New York Times wrote, “Airi Yoshioka played the violin solo touchingly”, and of a performance with Continuum of Dallapiccola’s music, the New York Times wrote “Powerfully communicative…violinist Airi Yoshioka [played] a lovely ‘Due Studi.’ The performances were as varied as the music.” She has premiered dozens of works and her latest recording project of works for violin and electronics includes commissions from such prominent women composers as Tania León, Linda Dusman, Alice Shields and Milica Paranosic. Educational outreach has been a vital aspect of Ms. Yoshioka’s professional life through her work as a teaching artist for the New York Philharmonic and Lincoln Center Institute. In addition, she has taught music at New York City public schools through the Morse Fellowship program and has performed in hospitals, hospices, and nursing homes as a recipient of the Community Service Fellowship. In October, 2004, she organized Art Reach!, a three-day symposium on effectiveness of arts outreach. The highly successful occasion brought together teachers, teaching artists, administrators, and community leaders from Maryland. 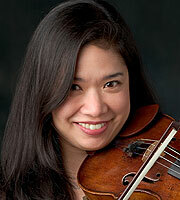 Currently, she is Professor of Violin at the University of Maryland Baltimore County. Her solo and chamber performances can be heard on Naxos, New World, Claves, Mode, Albany, Neuma, and Pony Canyon records labels.